Dry eyes often result in uncomfortable sensations such as itchiness, burning, or the feeling that something is in the eye. This is frequently caused by insufficient production of tears or a change in the normal composition of tears. There are treatments and management techniques for alleviating both the irritating symptoms and the underlying causes, of which there are many possibilities, ranging from the environment to a hormonal imbalance. Keep reading to learn more about dry eyes, its causes, risk factors, symptoms, and treatments. An estimated 5 million Americans over age 50 suffer from dry eyes, and over half of them are women. Tears are not just the water from crying, but also a 3-layer liquid that lubricates the eyes. Women who take estrogen are 70% more likely to experience itchy eyes. The human body produces tears regularly in order to keep the eyes moist and clean, as well as to protect them from infections and foreign debris. Every blink spreads tears across the eyes. Tears contain not only water, but also oil, mucus, and nutrients; therefore, sufficient tears of the proper makeup are essential for maintaining healthy and comfortable eyes. Tears consist of three layers: a mucus foundation, a watery center, and fatty oils on top. The mucus helps to spread tears evenly over the eyeball, the saline (saltwater) moisturizes the eye, and the oily layer helps to slow the evaporation of the saline. Hormones, or the brain's signal messengers, are responsible for the direction of tear production. Many glands and tissues in the eye, called the lacrimal unit, work together to produce tears. 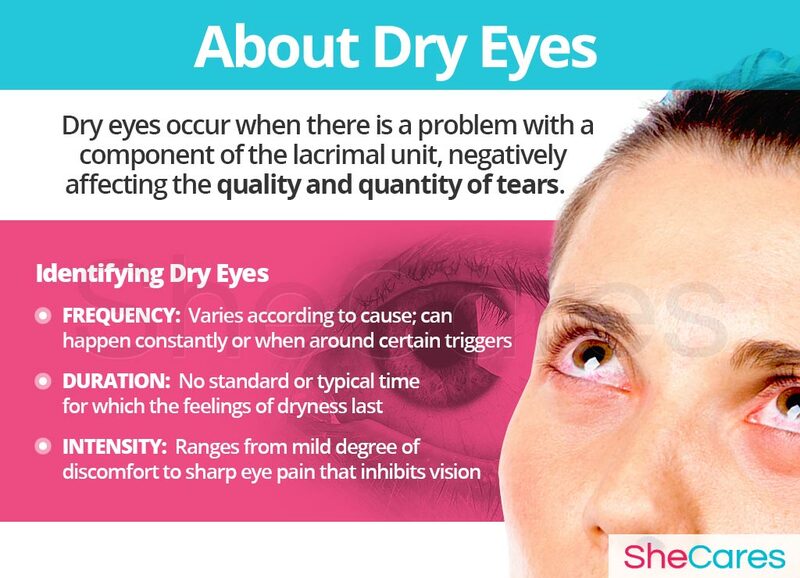 Either a hormonal imbalance or a problem with any component of the lacrimal unit could negatively affect the quality and quantity of tears, resulting in dry or scratchy eyes. Because of all the variables involved, there are many possible causes of dry eyes. Keep reading to find out more about all these potential causes. Significant hormonal changes also take place during certain the stages of reproductive life, such as puberty, pregnancy, post-partum (which includes breastfeeding), and menopause. These fluctuations can often be the cause behind dry eyes. Symptoms of dry eyes can vary greatly depending on the cause of the disorder and the individual. Women experience a wide range of symptoms on the scales of frequency, duration, and intensity while suffering from dry eyes. Eye dryness is a condition that can emerge at any age in life. Poor tear production can result from environmental factors, lifestyle, hormonal imbalance, other medications, or a more complicated disease. It is important to identify the cause(s) of itchy eyes in order to best know how to manage and treat the condition. Continue reading to learn more about the hormonal and various other causes of dry eyes. Since hormones are responsible for stimulating the production of tears, fluctuations or imbalances in hormone levels during certain times in a woman's life - especially puberty, pregnancy, post-partum, and menopause - can often cause dry eyes. It is important to note that a deficiency of the hormone estrogen - which often occurs during these periods of fluctuation as well as during some points in the menstrual cycle - is a type of imbalance; more does not necessarily mean better. An excess of any given hormone can also aggravate scratchy eyes. Studies show that women who receive hormone replacement therapy or take estrogen are more likely to develop dry eye syndrome. Likewise, a deficiency of testosterone in women can cause eye dryness since testosterone stimulates the lacrimal gland to produce the saline component of tears. Therefore, a flux in the body's production of hormones can result in an alteration of the amount of tears or of their composition. Hormonal fluctuations are common and normal during a woman's menstrual cycle. This change in hormone balance causes some women to experience cramps, headaches, and dry eyes. The hormonal fluctuations during puberty - when a girl's body begins the process of sexual maturation - result in many changes. 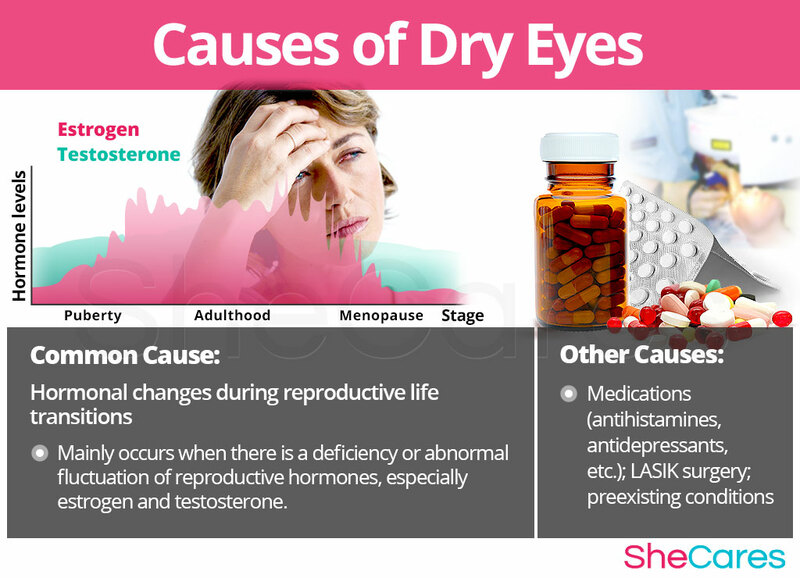 The shift in the balance of hormones can affect the eyes in various ways, including feelings of dryness. Pregnancy has distinct demands on the body as hormone levels fluctuate drastically as the body changes to accommodate both mother and child. The change in hormones affects the production of tears, and other factors also affect eyesight during pregnancy. Post-partum - or during breastfeeding - causes the body's hormones to continue to be in a state of flux. Often, eyes that are itchy or scratchy during pregnancy will continue to be for several months after the birth of the baby. Menopause is the stage in a woman's life when the amount of reproductive hormones naturally declines, indicating the end of fertility. In addition to hormonal causes, other factors compound the reasons for dry eyes during this stage, including other symptoms of menopause. While hormonal imbalance is the underlying cause in many cases of dry and itchy eyes in women of all ages, due to the complexity of tears and their production, both side effects of medications as well as preexisting conditions can cause dry eyes. 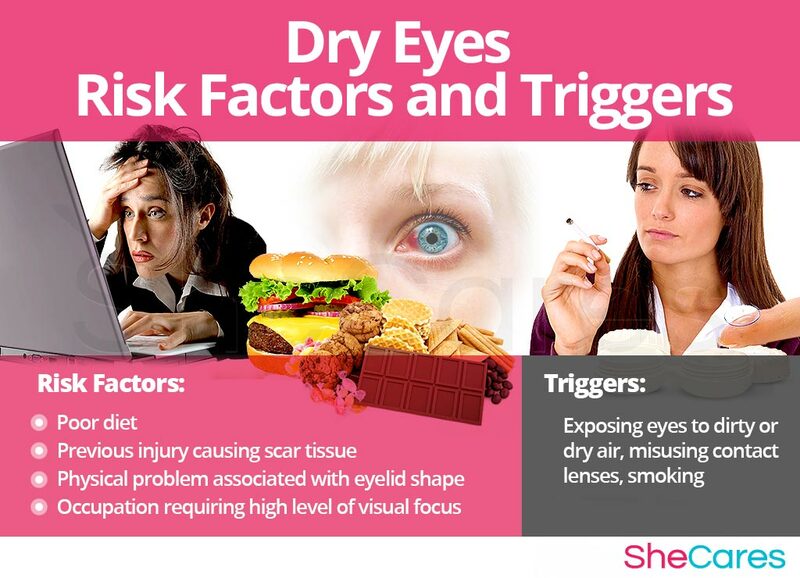 Continue reading to see what risk factors and triggers can provoke dry eye syndrome. 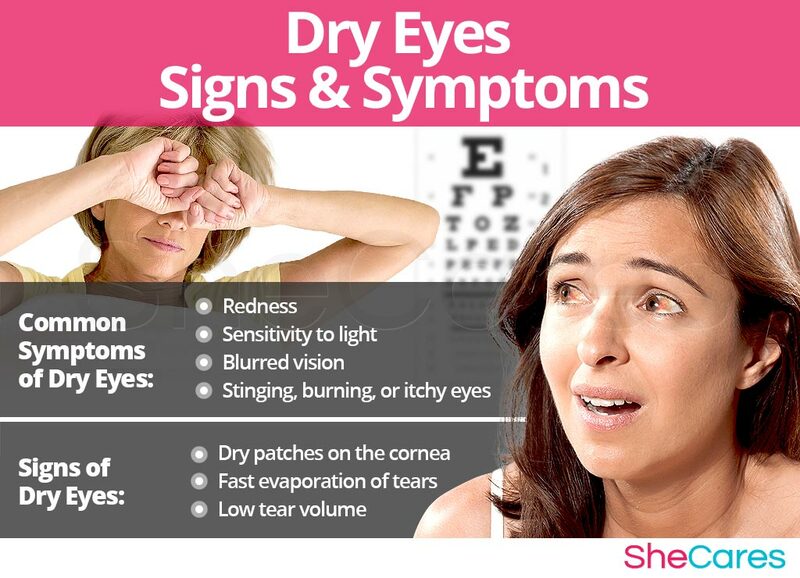 Women are at risk for dry eye syndrome due to the greater fluctuation of hormone levels in the female body. Women over 50 are at an even greater risk because they must deal with not only a drop in hormone levels due to menopause, but also changes in eyesight due to natural aging. In addition to age and womanhood, medical history and environment are additional factors to take into consideration when evaluating the possibility of developing dry eyes. In addition to the long-term risk factors that predispose a woman to dry eye syndrome, pain and discomfort can also be triggered, producing immediate symptoms. These factors can cause dry eyes - or aggravate eyes that are already itchy and uncomfortable. Both environmental and behavior triggers can provoke or worsen dry eyes. These include factors such as leaving in contact lenses or smoking. Read further to learn about the symptoms of dry eyes and how to choose a treatment based on the particular cause. Because dry eye syndrome can emerge from any one of many possible causes, it also has a range of symptoms. While every patient will experience some of the symptoms and not others, most suffer from these typical ones, whether the dryness is caused by hormonal imbalance or another factor. Note that in case of hormone imbalance, usually both eyes are affected equally as opposed to one or the other. To identify the signs of dry eyes and diagnose the disorder, a doctor or ophthalmologist typically performs a series of painless procedures to look for the signs listed above. These include medical history, a complete eye exam, and one or more dye tests. In rare cases, if dry eyes remain untreated, they can lead to certain complications. However, it is important to note that these complications are extremely uncommon and are not a normal or typical result of dry eyes. Some of these rare, more severe symptoms of dry eyes that can indicate potential complications include extreme sensitivity to light and loss of vision. Many of the severe symptoms of dry eye are a more extreme version of the common symptoms. Any symptom of dry eye can worsen over time and, in rare cases, lead to complications such as eye infections like conjunctivitis. Women who experience dry eyes at any time of their lives - especially mild symptoms - may want to take steps to reduce and manage the discomfort. Keep reading to learn more about management techniques as well as prevention measures for women in life stages of hormonal flux. There is no one way to fully prevent dry eyes since all women experience natural hormonal fluctuations throughout the course of their lives. Nonetheless, there are some simple steps a woman can take to reduce the chances of developing dry eyes or experiencing the symptoms. In preventing dry eye syndrome, both behavior and diet are key. Fortunately, there are many simple adjustments that can be made in everyday activities to reduce the risk factors of dry eye syndrome and avoid discomfort, especially during times of hormonal flux. 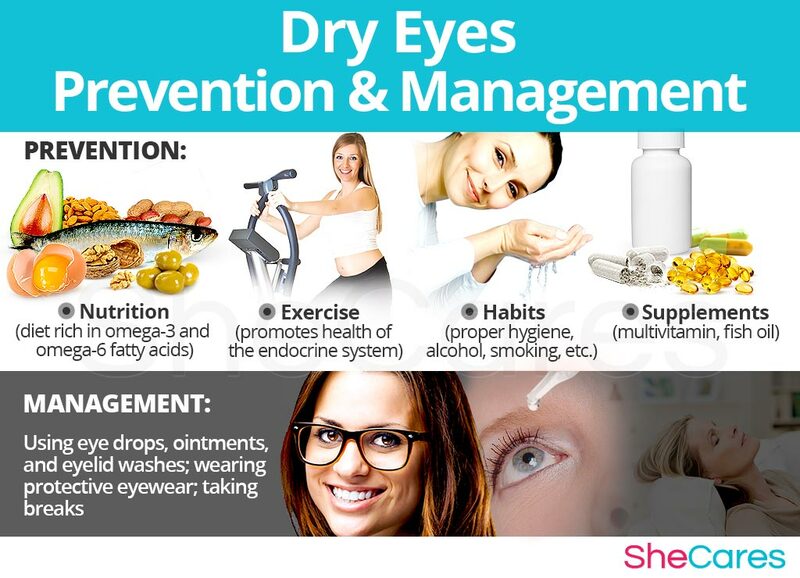 For women who are already experiencing dry eyes, prevention is no longer possible, but fortunately, there are ways to manage and reduce the symptoms. Keep reading to learn some management tips for women of any age. There are several quick, cheap, and effective ways to manage dry eyes, especially for mild symptoms or occasional episodes. While the effectiveness of each individual technique depends on the symptoms and cause, many of these general tips work for all women experiencing dry eyes. Avoiding triggers, using eye drops, or wearing protective eyewear are all good ways to manage discomfort. While these measures often help to reduce the symptoms and irritation caused by dry eyes, they do not treat the underlying problem, which is often a hormonal imbalance. Fortunately, there are several natural treatments available that can directly treat the hormonal causes of dry eye syndrome. Continue reading to learn more about the range of possible treatments for scratchy eyes from several different approaches. Dry eye syndrome, which is commonly caused by a hormonal imbalance, can be painful and uncomfortable as well as affect quality of life. If dry eye symptoms persist, it is important to seek treatment to avoid rare but possible complications. Fortunately, there are a myriad of effective treatments available; the most appropriate one for each case depends on the underlying cause. Three levels can be considered for treating dry eyes. These are categorized as: (1) Lifestyle Changes, (2) Alternative Medicine, and (3) Pharmaceutical and Surgical Options. 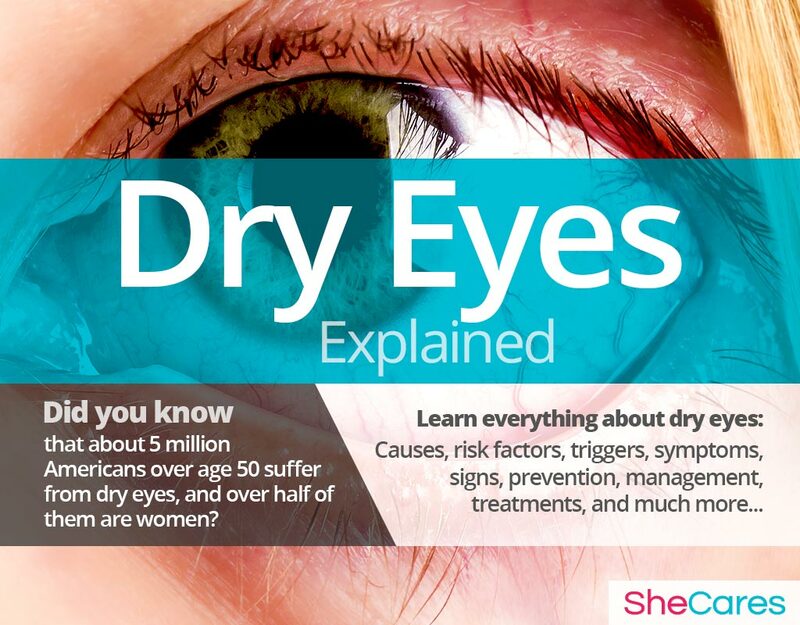 Women experiencing dry eyes are encouraged to start with the least risky approach to treatment - lifestyle changes - and later proceed to the next level of care if necessary. 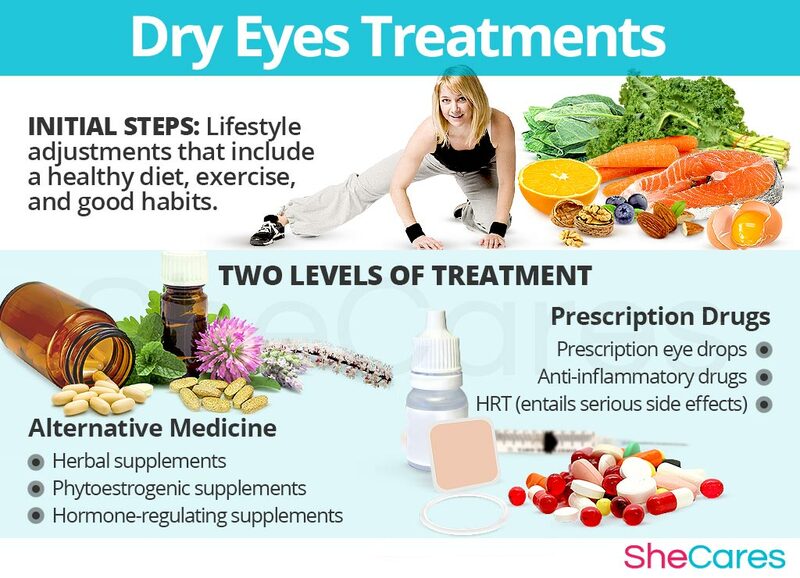 Medical intervention is not always needed to treat dry eyes, but some women who still experience the symptoms after trying lifestyle adjustments and alternative medicine - or those who are at risk for complications - may wish to consider pharmaceutical options, but only after adequately accessing the risks associated with that type of treatment. This first level of treatment requires the least amount of risk but the highest amount of self-discipline. Often, simple lifestyle changes can relieve the symptoms of dry eye as well as provide overall benefits to one's health. Fundamentally, an improved diet and healthy habits can sometimes alleviate the most common symptoms of dry eyes. These changes will help provide relief for dry eyes, but it is important to note that they do not directly address hormonal imbalance. Therefore, additional treatment may be necessary. Alternative medicine has proven to be a great way of treating dry eyes caused by hormone imbalance safely and naturally. Supplements and other alternative medicines involve little-to-no risk and can be a very effective means to treat dry eyes. There are two main types of herbal supplements that can be used: phytoestrogenic and hormone-regulating. See the table below for a comparison of these two kinds of supplements. These supplements contain components that are similar to estrogen but produced by plants, such as black cohosh. These compounds raise the low estrogen levels present in a woman's body during times of hormonal flux, helping to alleviate dry eyes caused by hormonal imbalance. However, dry eyes are caused by an imbalance that involves other hormones as well, including testosterone, not just a shortage of estrogen. These herbal supplements tend to be more effective for menopausal women since women in that stage typically have lower estrogen levels; therefore, they are not necessarily as effective for women in other life stages. These supplements, including Macafem, nourish the pituitary and other endocrine glands, which promotes the body's own natural hormone production. This allows the body to produce hormones more efficiently and in greater balance, resulting in better levels of not only estrogen, but also progesterone and testosterone. These herbal supplements can be considered the safest and most natural way to treat the underlying hormonal imbalance behind many cases of dry eye. They can be taken throughout the course of a woman's life since they promote natural hormone production in the body. Some other types of vitamins and herbal supplements are available that can also alleviate the symptoms of dry eyes or at least make them more manageable. The most effective treatment is usually a combination of approaches. Lifestyles changes along with alternative medicine will typically be the best way to alleviate the symptoms of dry eyes. However, in cases of more severe symptoms or complications, a more drastic treatment may be called for. Treatment at the third level involves the highest risk and usually the greatest costs. Some treatments may not be suitable at every life stage. So, it is highly recommended that women see a licensed healthcare professional before beginning any pharmaceutical treatments for dry eyes. In addition, some options may require a prescription from a doctor. For dry eyes, there are some prescription drug treatments (both topical and oral) as well as surgical options for rare and severe cases. Since hormonal imbalance is a common cause of dry eyes, some medications may be used, though the risk is high. These three approaches - lifestyle changes, alternative medicine, and pharmaceutical options - are not mutually exclusive. A woman who suffers from dry eyes may want to try different approaches at different times or a combination thereof, depending on the duration and severity of the symptoms experienced. However more and more women have been finding that a combination of healthy lifestyle and alternative medicine provide the best relief for their symptoms.